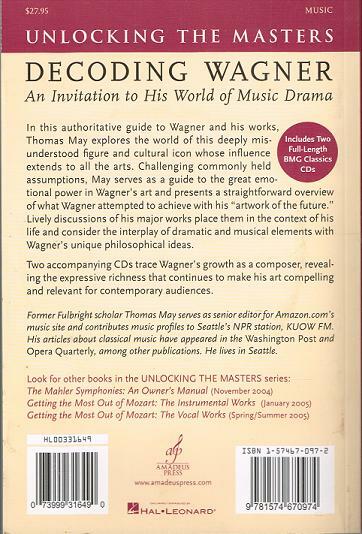 “In the voluminous Wagner bibliography, Thomas May's book occupies a special place. Concise but remarkably information-packed and accompanied by two CDs of excerpts, it is addressed to those who seek a deeper understanding of Wagner's operas. The controversies - artistic, human and moral -generated by Wagner's innovative ideas and reprehensible behavior frequently obscure the greatness of his achievements. May performs an extraordinary feat: although unflinchingly aware of Wagner's arrogance, self-aggrandizement, duplicity, faithlessness, hedonism, greed, political opportunism, chauvinism and anti-Semitism, he communicates boundless admiration for the composer and passionate love for his works. Suggesting that the very schism between Wagner's flawed character and idealistic aspirations inspired monumentally stirring meditations on the contradictory range of human experience, he correlates and reconciles his monstrous ego with his sublime genius. The evolution of Wagner's operas, from his early and incomplete attempts to the late, often extensively revised masterpieces, culminated in a lofty artistic vision: the total artwork which, combining all the arts, would result in heightened experience and spiritual elevation. Wagner wrote his own texts, considering poetry and music inseparable and himself equally master of both, an assessment not universally shared. May takes the librettos very seriously, following them from their historical or mythological origin to their final form with formidable but unobtrusive erudition. Among his references are the Buddha, Aristotle, Shakespeare, Thomas Mann and T.S. Eliot, and he must have read everything about Wagner as well as Wagner's own often repellent autobiographical, theoretical, and political writings (which make one wish he had written nothing but music). May's musical analyses are equally riveting and absorbing. 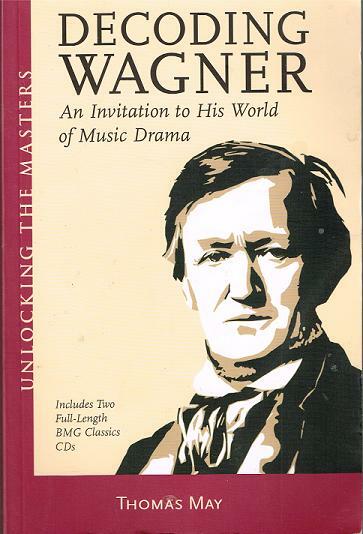 He traces the operas' ever-increasing depth, breadth, and grandeur, the growing importance and masterful use of the unifying leitmotif and the Wagnerian orchestra, and the often hidden strands that connect them despite their individual uniqueness. Opera lovers spurred by May's book to hear these works performed could not wish for a more knowledgeable, illuminating, and inspiring guide."